There's nothing I like better than a quick and easy recipe. Having 3 little kids underfoot doesn't leave me much time to be slaving away in the kitchen. I love to make homemade potato soup but I found my one recipe to be really time consuming and so I didn't make it as often as I would have liked. 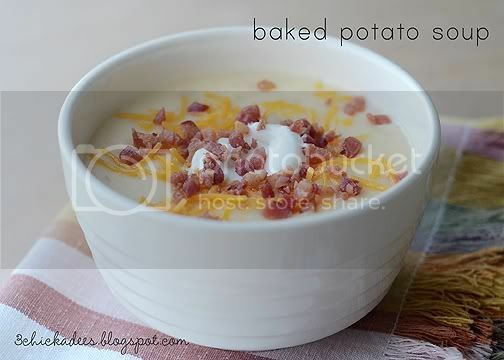 When I saw this recipe for baked potato soup my curiosity was peaked. Not having to cut up and cook potatoes and then puree them sounded so appealing. Baking the potatoes made making potato soup so much easier! This recipe was a real hit! Prick your potatoes with fork. Place on baking sheet and bake in preheated 400° F oven for 1 hour. Let cool and then scoop out the insides of the potatoes into food processor. Pulse until broken up into smaller chunks. Melt butter in large pot. Add about half of your flour and whisk into the butter. Continuing whisking and cook for approximately 2 minutes. Whisk in the chicken broth, milk and the remainder of the flour. Cook until thick and bubbling. Stir in the potato chunks. Add the cheddar cheese and stir until melted. Remove from heat and stir in the sour cream.